There are some simple 'do's' and 'don'ts' which will help you to keep the your hot tub cover in pristine condition, especially important at this time of year as you are probably unveiling your hot tub after a winter break. The first thing to be aware of is the importance of using the correct cleaning materials. In knowing what will produce the best result without damaging the hot tub cover in any way will help you add years to the life of your hot tub. Alternatively, using the wrong products could cause you all sorts of expensive problems further down the line. Industry experts say that the most common cause of cover fading, cracking or quick deterioration is the use of damaging products – abrasive products will strip the top, protective layer from the vinyl causing it to fade, crack and disintegrate. To clean your hot tub cover properly you will need a non-abrasive cleaner, a sponge or soft cloth and an oil-free protectant or silicon based, cover cleaner. If you think of caring for your hot tub cover as the same process as treating leather, it needs to be kept clean and supple to avoid cracking but the cleaning and care must be carried out using gentle products. It is best to avoid products that contain alcohol, bleach, detergent, soap and particularly oil. This latter point is important because oil will amplify the sun's rays, which in essence means your hot tub cover will 'cook' in the sunlight. The first stage in cleaning your cover is to loosen and remove dirt and leaves by washing it with a garden hose or a few buckets of water. Not all the ingrained dirt will wash off at this point but you will loosen it and make it easier to clean off later. Make sure you have cleaned all the cover, including the apron and underside. You might find that you have some especially tough areas to clean – bird droppings are notoriously difficult to remove. For caked on dirt and other hard-to-remove substances try the following process: Spray or wipe on the cleaner, let it soak for up to five minutes, wipe away and rinse with the hose. If this still fails to remove the dirt repeat this process. The Ultra Mitt will really get to grips with those stubborn stains! 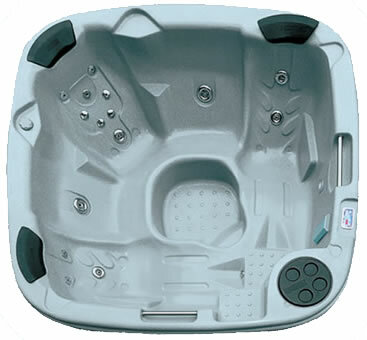 Moss and mildew is a common problem, particularly if you have not used the hot tub for a few weeks. Check areas such as the zip and stitching to make sure it is clear of moss and mildew. If you see any problems developing it is important that you tackle it immediately. Use the rough side of the sponge with a little cleaner. With a little extra effort, the moss and mildew will clean off quite quickly. Once it is clear of the problem, use some moss and mildew protectant to prevent the problem recurring. In some cases you will find tree sap or pitch can prove a stubborn substance to remove. To treat this, rub a little margarine or olive oil onto the affected areas. Once the sticky tree sap has been removed take particular care over removing any oily residue. While regular cleaning will add years to your hot tub cover's life span, you must also be aware of the effect that chemicals can have on your cover's lifespan. Over-chlorination, excessive ozone contact, or imbalanced water chemistry are all factors that will contribute to the swift disintegration of your hot tub cover. An imbalanced water chemistry can cause bleaching, puffiness within the vinyl and disintegration of the stitching. The best way to prevent this is by testing and balancing your water on a weekly basis. This should be done as a matter of course to maintain the good health of your hot tub as well. Alkalinity levels should lie between 80-120 and the pH should be maintained at levels between 7.2-7.8. The chlorine level should be 1.5ppm-3ppm and Bromine 3ppm-5ppm. By caring for and regularly cleaning your hot tub cover and ensuring its environmental conditions are at optimum level you will prolong its life by many years – and get a return on your investment. If all else fails and your cover is beyond hope then you will need to replace it quickly. Check out our custom made range of hot tub covers here.